Indiana University of Kokomo is growing at an incredibly fast rate. IUK is launching this community into a bright and bold future. We at Solidarity feel that it is important to support the future leaders and the community to create a better tomorrow. This account is available to the students, facility, staff, employees and alumni of IU-Kokomo. 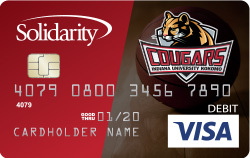 For every (new) IUK-Cougar checking account opened we donate $10 to a Scholarship Fund for future students!